The fabulous Bud Boy bong, in the classic shape of a bouncer base tube, features a built-in chillum as well as a bubbler/percolator that cools your smoke. This way, you can enjoy immensely powerful, yet incredibly smooth bong rips. The bong is black with a clear midsection that gives her a very elegant appearance. The height of the bong is approx. 43cm; diameter is 50mm. Made from sturdy acrylic. 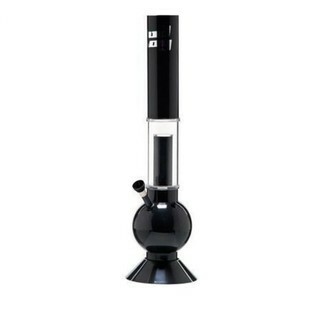 The black Percolator Bong by Bud Boy may at first look like an average bong, given that she has the classic bong shape of a bouncer base tube with a wide base. That this bong is anything but typical becomes clear when you take a closer look at her, and, of course, when you can take your first hit! The bong connects to a built-in chillum that spreads your smoke in the water, and it has a percolator/bubbler that cools your smoke. Take a rip, and you'll be amazed how smooth and cool the smoke of the Bud Boy Percolator Bong is! Yet, she delivers insanely powerful bong rips par excellence. At about the height of where the bowl is, the Bud Boy also features a kick hole so you have some more flexibility in how you want to toke. Made from sturdy acrylic in a glossy black finish, with a clear midsection, the bong makes a very elegant impression. Even the metal bowl of the bong is black, which isn’t exactly common. The bong is emblazoned with the Bud Boy logo at the top, near where the tube ends in a comfortable mouthpiece ring made from silicone. The bong has a height of 43cm and a diameter of 50mm. It comes with a silicone mouth cover and a silicone lid.